Back in christchurch, although the town's not that bad at all this time. Staying in a place called old country house now. A bit more expensive, but it's all paid by Adventure since technically the tour ain't over til tomorrow. Had a great night out, and I'm so going to miss the more liberal dispensing of alcohol when I get back to Sweden. Not that I'm drinking that much, but just being able to buy a round of beer for everyone and not kill your bank account is awesome. Just managed to get settled in the hostel when I get out with a group of Irish people to a really cool pub called Pomeroys. If anyone of you ever get to Christchurch, make sure you pay a visit to Pomeroys. Looks like any other pub, but what they serve is spectacular. 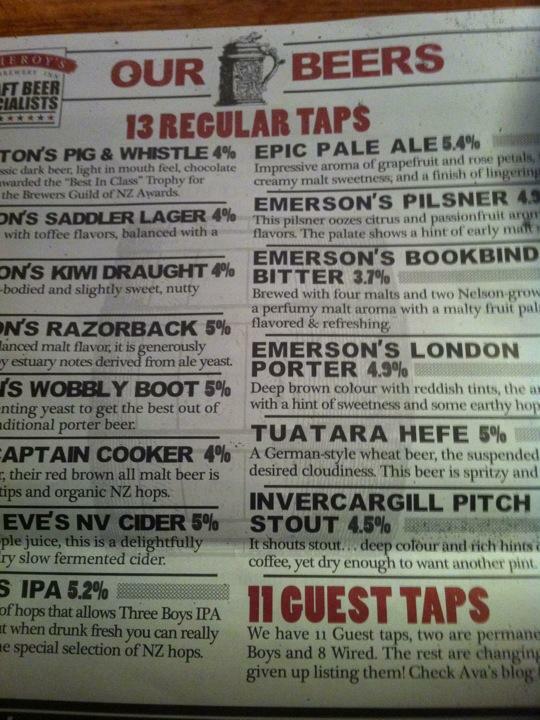 They've got 13 different beers on tap that they keep permanently and about 11 temporary ones. All off them locally produced and really delicious. Ranging from almost yellow and clear to pitch black stout. Mixing that with a bowl of wonderful fries makes it even better. Right now, I'm back at the hostel watching movies after a soft night out with a bunch of Irish. Have to get there someday, really.